Holy City Hospitality has just expanded its list of fine restaurants in the Lowcountry to another frontier – namely, Daniel Island. Just in time for a fun-filled summer, the new eatery promises creative cocktails, fresh local seafood with a taste of sushi and an atmosphere that locals and visitors will find inviting. Right before the Islander opened its doors, I had the opportunity to speak with general manager Eric Foor and executive chef John Whisenant about their plans for the restaurant. Trust me, these guys have some terrific ideas up their sleeves, partly thanks to the inspiration they’ve gotten from the Daniel Island residents. Holy City Hospitality’s other well-known ventures have included 39 Rue de Jean, Virginia’s on King, Coast and many more. 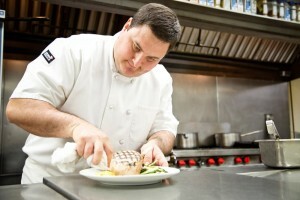 Whisenant has worked in the kitchen of other HCH restaurants (including helping open 39 Rue de Jean and working as its sushi chef – as well as The Daniel Island Club, yet he claims he’s “most excited” about his vision for The Islander. “This will be my kind of cuisine,” he explained. But from what I gathered, it’ll be everyone’s kind of cuisine, including your picky eaters under 12. Whisenant eschews the idea of the typical hot dogs and chicken fingers kid menu in favor of kid friendly sushi, salads and other healthy options. Adults, too, will be pleased with the array of fresh, local recipes. While the menu was not officially confirmed the day I met with Whisenant and Foor, it sounded like a great spread: house-ground burgers, pork chops, catch of the day, creative salads, shrimp, fish tacos and more. Located where Queen Anne’s Revenge used to be, The Islander has a definitive island vibe. For one thing, the outdoor/indoor bar is the perfect place to belly up and grab a cocktail at the height of summer, and the proposed cocktail menu will have plenty of choices. Whatever you happen to be ordering at The Islander, it’s almost sure to be prepared in-house. From the sauces to the Tasso ham and sausage, Whisenant is nearly religious about his belief in items made from scratch. When I asked why Holy City Hospitality’s first restaurant apart from the Charleston peninsula is on Daniel Island, Foor’s answer was simple. Visit The Islander at 160 Fairchild St. or online at www.The IslanderDI.com or call (843) 388-6366.